Let’s start with a minor math refresher. The Fibonacci Sequence is a series of numbers starting with zero or one, with each subsequent number being the sum of the previous two. In other words (or numbers): 0, 1, 1, 2, 3, 5, 8, 13, 21, 34 and so on. It’s named after the 12th- and 13th-century Italian mathematician, and often talked about in association with the Golden Ratio, which is often depicted as a rectangle that spirals into increasingly smaller ones. 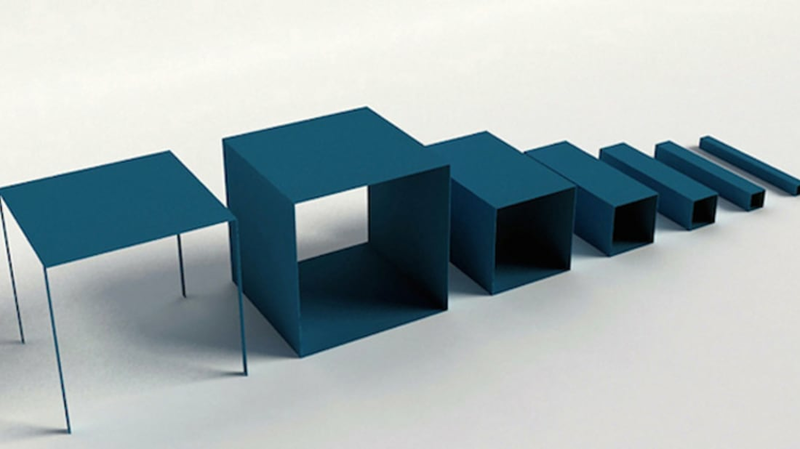 Designer Peng Wang has taken that visualization of a mathematical concept and turned it into furniture. His “Fibonacci shelf” is made up of six rectangles of anodized aluminum that follow the famous sequence, and can be reorganized and stacked in any number of ways. The piece can be used as a table, chairs, an entertainment center, and of course, a very cool-looking shelf. There’s a mystical quality to the Fibonacci Sequence, and looking at different configurations of the shelf is appropriately mesmerizing. The furniture serves as a manifestation of the place where math and art intersect, and does justice to the beauty and elegance of them both.